Kids, Cows and Grass: A baby is born! 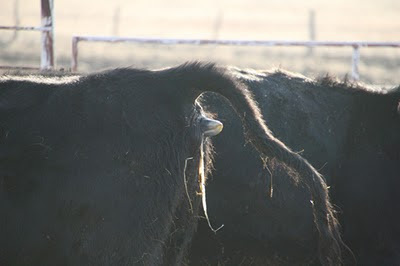 Often the first sign of a cow in labor is her raised tail. She will look for a place to be alone. 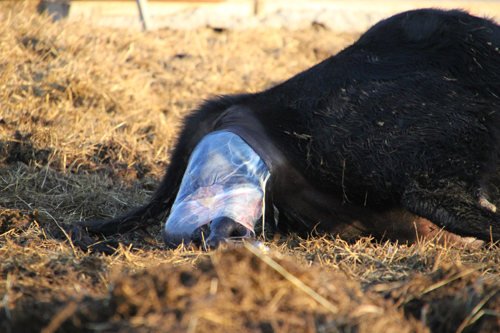 The membranes may appear as a water "balloon" that will burst and you can then see the calf's front feet. I usually don't get to see calves actually born. 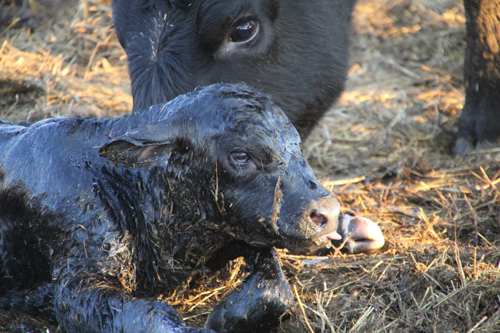 We have nearly 300 calves on our ranch each year, but when I see a cow in labor, I leave her alone to have her calf and I return in about 30 minutes to see a live calf. She will be licking it and teaching it to nurse. So when a heifer was in labor yesterday in the sunshine, I decided to get my camera and sit and watch. From the point of when the calf's feet are showing, to delivery, it should only be about 30 minutes. A heifer should calve within 30 minutes of the feet being presented. I check to make sure the calf is presented correctly by how the feet look. 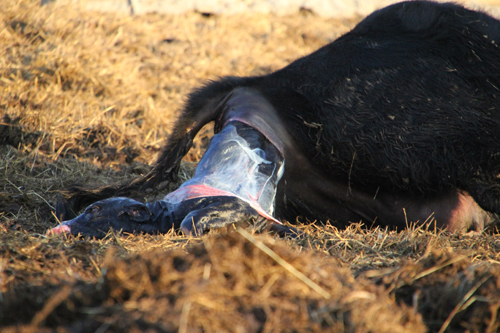 If they're upside down, the calf is backward and we need to help her deliver. Uh-oh. She seems me! 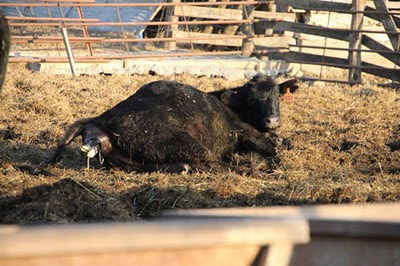 Cattle like to be alone and protected when they calve. Soon she is too busy pushing to worry about me. I hid behind the feed bunk! You can see the calf's nose now. The front feet should come first, with the nose and head next. 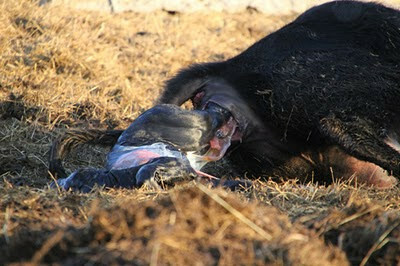 Soon the head is pushed out with the calf's knees (or elbows?!). 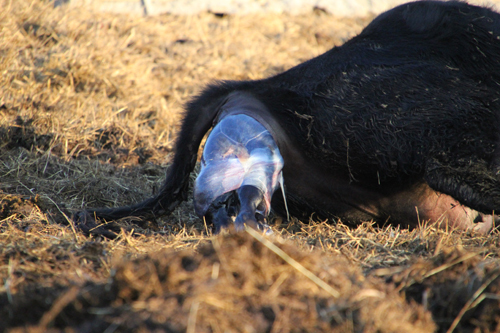 The membranes are still around the calf. Very quickly the cow pushes the calf out. The shoulders can be a difficult part. But this time, the calf's shoulders slide right out. The cow is really concentrating and I can sneak closer. She has the calf pushed out to his rib cage, and he tries to breathe, but he can't yet because his rib cage is still compressed. His tongue is sticking out reaching for a breath! As his rib cage is pushed out, he stretches out to take a breath. 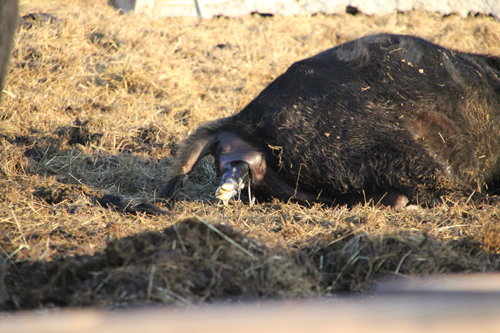 The mama cow is still focused on her contractions. The hips can also be a point of difficulty. If the cow's pelvis is shaped wrong, or if the calf is very large, it may become "hiplocked." 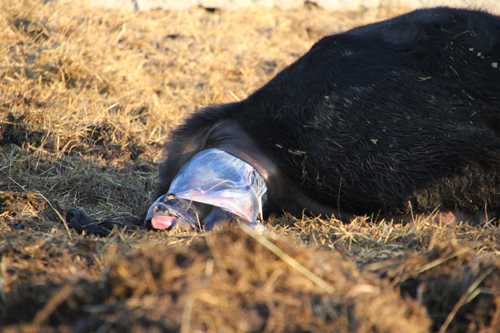 As the calf is born, it rotates slightly to free the hips. Unfortunately as the calf rotates, this time his head becomes rotated and his body pushes it around. If he doesn't straighten out quickly, he may suffocate! The heifer finishes pushing the calf out. She must now stand up soon and begin licking the calf to get him to breathe immediately. Another successful delivery! Congratulations, it's a boy! This is awesome! Our "herd" consists of 4 cows so we always watch pretty close and the kids love to watch the cows give birth and because they were show heifers they are used to use and don't mind! What fantastic photos -- nature really is spectacular and miraculous. Do you ever have to lend a helping hand during labor? 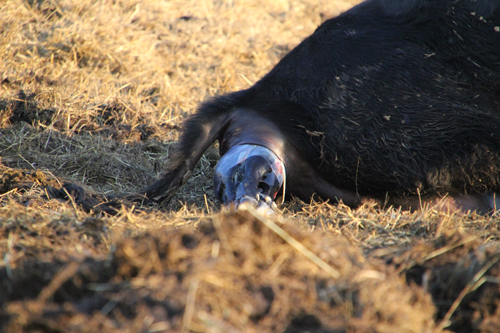 Dane, Yes, sometimes I do have to help a cow or heifer in labor. But that is very rare. For the most part, Mother Nature is really amazing and everything goes right! Great documentation! 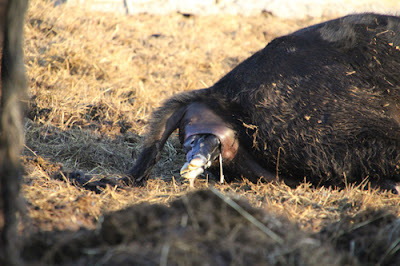 We're about to start calving in a few more weeks. Don't know if we'll make it home to help any, but sure would like to. Wonderful shots Debbie. 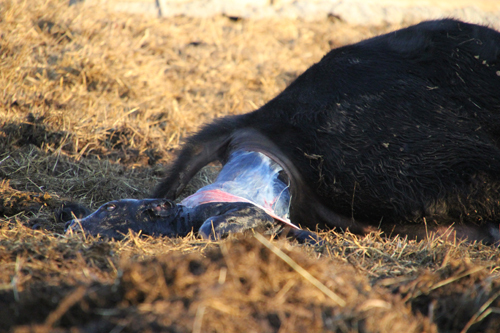 I've always left the cow or heifer alone too, but I would love to get pics of a birth. Lucky you! How cool. That was great. thanks.